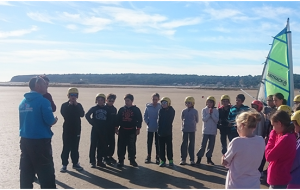 The optimist, in groups of 12 Max, the support of the schools of sails on which the teachers learned the navigation. 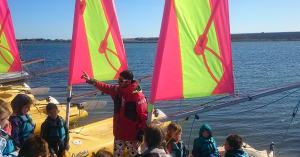 For the children of first and second grade, two or three per boat, depending on the conditions, so that they can feel safe. The yachting sand, alone or in pairs, discover unique sensations of gliding only a few centimetres from the ground, feet dry. Suitable for children from the third grade, in a small group of 14 max. (per monitor) and whole class for the larger ones (2 monitors si + 24). 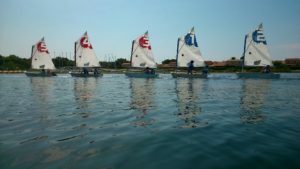 The funboat learn the sail in a playful way without risk as well as its medium to two or three per boat. Few constraints, one is quickly in action while adapting quickly the progression to students and conditions, ideal for children from the third grade. The Stand up paddle per group of 12 Max. 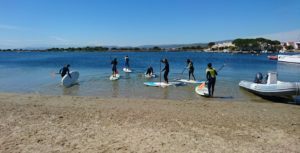 Equipped with a board and a paddle, sitting, standing or kneeling, the youngsters test their balance in a playful way, the sensations are there!. Possibility to discover also the canoe for groups from 8 to 10 max. 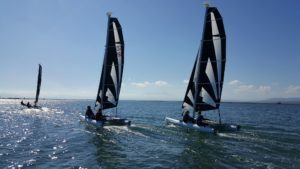 The catamaran at 3 or 4 per boat, the young people will be able to progress on these more technical and powerful boats. Plan, minimum, a cycle of 3 sessions, to have a real gradual and constructive learning. 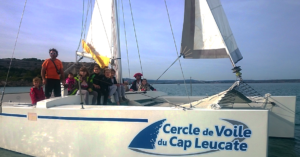 The Aquali33, the possibility to embark 10 people, on a catamaran to discover the sail and the lagoon of Salses-Leucate. Accompanied by the instructor it is accessible to everyone, whatever are age and his skills ' ' know swim ' ' not acquired.